When the Twilight franchise began to breakout at the box office, I just sort of ignored it. When the Twilight movies re-launched a craze in Hollywood to release vampire/werewolf movies (Fright Night and The Howling Reborn for example), I shrugged it off. But now with the release of Abduction, the popularity of Twilight has permeated beyond the genre thanks to somebody’s bright idea to make Taylor Lautner into some action hero. Thanks a lot. Nathan’s home life is nice, though. He lives in an upper class 2-story house with two loving parents: Kevin (JASON ISAACS) and Mara (MARIA BELLO). Unfortunately not everything is as it appears to be and Nathan’s life turns upside down when, while working on a sociology report with Karen – who just so happened to be assigned to work with Nathan – discover a website for missing youth and find a picture that bears a striking resemblance to Nathan when he was younger. To further his concerns, he uses an age program which makes it almost proof positive. So, the question is, who are those people living in that house? The proof comes when he finds the exact shirt the missing boy was wearing in the picture in a pile of his old childhood clothes. Confronted with the evidence, Mara reveals that it is true but that there’s more to the story. She wants Kevin to be there for the explanation but before that can happen, there’s a ring at the door by a couple of black tied dudes and all hell breaks loose the aftermath of which leaves Kevin and Mara dead and Nathan on the run with Karen (she was on her way over as the chaos was occurring). The house explodes because the bad guys apparently were able to plant a bomb in the oven while taking on two skilled fighters but the explosions leaves Karen wounded. Nathan takes her to the hospital where he runs into Dr. Burnett (SIGOURNEY WEAVER) who we met early on as his psychiatrist helping treat him for anger issues and some nightmares he keeps having. Well, like everyone else, Burnett isn’t who she says she is but helps the pair out when the CIA and an agent named Burton (ALFRED MOLINA) get involved. She helps them escape not only pursuit by the CIA but, we learn later, some skilled Russian thugs led by Kozlow (MICHAEL NYQVIST) who want also are desperate to get their hands on Nathan. Why you might ask? Well, SPOILER WARNING, but it’s to get at his real dad whose a freelance spy with critical information that both the Russians and CIA desperately want/need. Alright, let’s get down to why the movie on the whole stinks: I don’t have anything against Taylor Lautner but between the Twilight Sagas and now this film, the young man might look good, but he cannot act and trying to make him into some young Matt Damon action superstar was an absolute and utter failure. The problem with Lautner is he really only has a few “looks” and in each one, his eyes remain brooding while his mouth will try to emote what he’s supposed to be feeling (curved up: happy; curved down: sad; no curvature; pondering; etc). Obviously the material doesn’t help matters but at the same time, even the action scenes don’t quite work. – Lily Collins, whose filmography includes The Blind Side, Priest, Mirror Mirror as Snow White, and the upcoming Evil Dead remake, is OK as the female lead although she doesn’t really do anything special or make an impact either way. 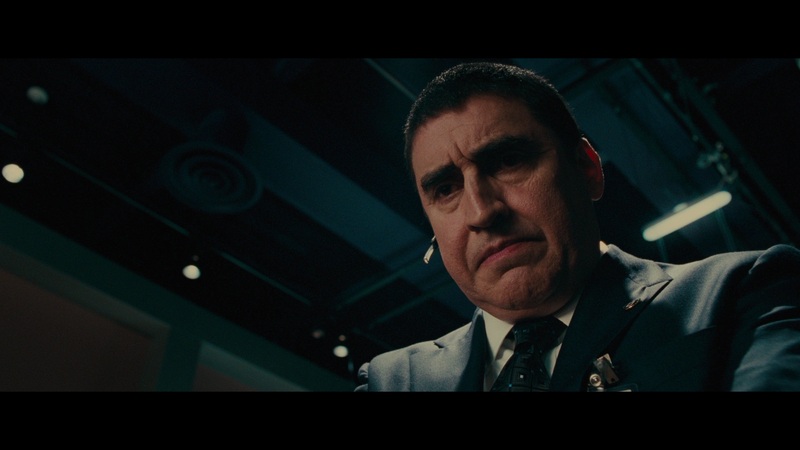 – Alfred Molina continues to make… interesting career choices between the dull Prince of Persia, the ill-advised and unfunny Pink Panther 2 and the whimsical yet forgettable Sorcerer’s Apprentice. For Abduction, I never quite found him that intimidating as a morally gray character but he at least makes the character a tad more interesting than he should’ve been. – It’s nice to see Jason Isaacs outside of his creepy role in the Harry Potter movies (and without that white wig) as well as Maria Bello who has become one of my favorite actresses. Despite not having a whole lot to work with, and limited time, they both provide the necessary weight to make the characters important enough to carry our “hero” through the film. – Michael Nyqvist plays a suitable villain but again, there’s really nothing noteworthy about him. He’s merely a Russian thug who can shoot a gun. Abduction was directed by John Singleton whose own career has taken a turn for the worse it would seem. After making a splash in his debut with Boyz n the Hood, his follow-ups, Poetic Justice and Higher Learning, certainly had merit. Then he went on to direct a remake of Shaft which wasn’t a bad movie but undoubtedly not a great movie by any stretch followed by 2 Fast 2 Furious (another “eh” kind of movie) and Four Brothers which had potential but never quite hit a home run. With this film, again, there’s really nothing that stands out with his direction. The action scenes are pretty generic, the acting is at best average and the actual look is fine but unremarkable. It looks entirely like a director-for-hire job. Collect the paycheck and move on to the next. Now I will say the movie isn’t all bad as even with Lautner’s bad acting and line delivery, I found at least parts to be slightly entertaining. No doubt, this still is not a good movie yet if you can overlook some of the drawbacks, it’s passable entertainment for 106 minutes especially if you don’t have anything else to watch. Otherwise, catch this sometime either on HBO or when it’ll eventually air on TBS and advertise to all the Twilight-ers. The Blu-ray comes with a glossy slip cover. Abduction Application – This is a customizable picture-in-picture feature where you select from three categories, so you can do just one, two or even all three and while the movie plays, you can watch the behind-the-scenes featurette/interviews while the movie plays in a smaller box. Some of what is shown are exclusive while others are available to watch in separate featurettes. Abduction Chronicles (18:17; HD) – This is Taylor Lautner’s “first-person account of shooting the film.” Basically it’s Lautner sitting in front of a black background talking about the movie with some behind-the-scenes footage intercut. Initiation of an Action Hero (11:57; HD) covers the action and stunts done by Lautner with the actor, crew members and his co-stars talking all about it. Nothing to write home about, but it’s an OK featurette. The Fight for the Truth (12:01; HD) takes on the fight work done by the entire cast and once again has interview footage with the cast/crew intertwined with behind-the-scenes footage. Pulled Punches (3:37; HD) is just the gag reel with on-set antics providing some laughs. 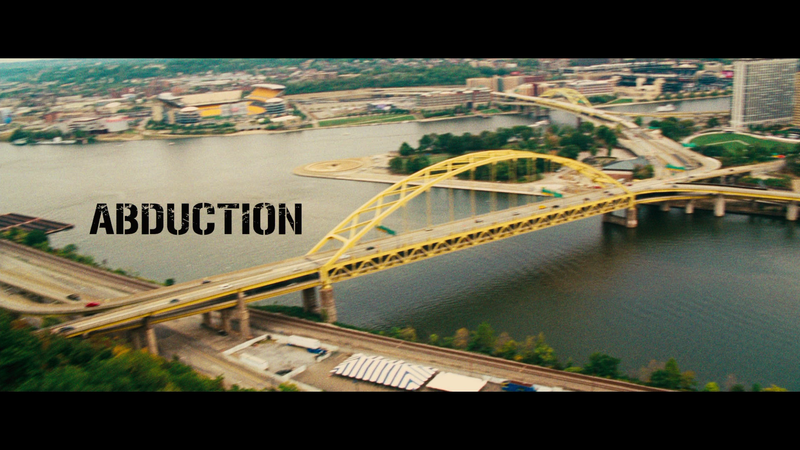 Lionsgate releases Abduction on Blu-ray in its original 2.35 widescreen aspect ratio. The 1080p HD transfer looks good with a sharp looking picture and a fine color array with skin tones looking well balanced. I didn’t really notice any imperfections such as artifacting or even edge enhancement. The movie might not be very good, but at this video transfer pops off the small screen. The disc comes with a loud, all encompassing 7.1 DTS-HD Master Audio track. The dialogue levels comes through the center channel very clearly without being overbearing while, when the action sequences picked up, the other speakers become more activated with a well balanced attack from all sides. But even the quieter moments, the front and rear channels provide a fine level of ambient noises. The LFE channel does get kicked on during the action scenes providing some depth to this lossless track. Overall, to say the least, Abduction is not a very good movie, the acting from Lautner is pretty bad (and at best merely average) while the talented supporting cast can’t overcome a lame script and overwrought storyline. The action sequences are all fairly average but at the same time I at least found some of it to be entertaining even when things get bad. I won’t say its worth renting but if you find it on the cheap or airing on television, then it might be worth checking out.